A worker holds one of about 2,000 birds found dead spread across some six kilometers of beach around the coastal city of Santo Domingo in central Chile. "It's a horrible scene. They are spread across some six kilometers (four miles) of beach" around the coastal city of Santo Domingo, San Antonio natural history and archeology museum director Jose Luis Brito told UCV radio. 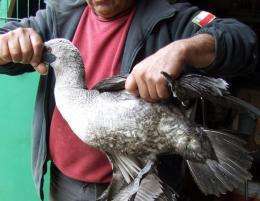 Most of the birds are gray petrels, but there are also pelicans, gannets and Guanay cormorants. Brito accused fishermen of "doing nothing" when birds get caught up in their nets, and leaving them "to drown before throwing the bodies back into the sea." The museum said it would file a complaint to police over the dead birds. About 100 bird carcasses were found on central beaches on Sunday. Thousands of dolphins and maritime birds, including many pelicans, have been found dead in neighboring Peru in recent weeks. Environmental groups blamed oil exploration work, but Peru's deputy environment minister Gabriel Quijandria, disputed the claim and said warming waters, which disturbs food supplies, was a possible cause. Its the magnetic pole shift that is causing instability of the magnetosphere and enhances geomagnetic excursion in a some areas. Just like Marses magnetosphere(whats left of it) has no stable south and north magnetic pole. This causes the animals to become confused because their navigation that depends on magnetic fields are distorted. They swim the wrong paths and become exhausted because they end up somewhere unexpected where there is no food etc or they plainly swim onto the beach by mistake. Another possibility is navy experiments with their sonar equipment or maybe HAARP(i dont know if the frequencies harm marine life though, i am just thinking here). Although this does not explain the birds i think my former explanation fits better as birds are proven to navigate by magnetic fields and so are fish and so are dolphins wales and sharks,. What about Fukushima's radiation plumes, plus all the other toxins that entered the pacific during and after the tsunami? The dilution is such that a homeopathic solution would contain more toxins. Think, man. How many above ground nuclear explosions happened between 1943 and 1963? The world is not the fragile basket you think it is, no matter what the government schrool taught you. While I agree that it probably wasn't Japan's radiation that did it I think you are over rationalizing things Shootist, if dilution were instantaneous then you would be correct but any addition to the ocean takes quite some time to disperse to a homogenous mixture, and it's never actually homogenous. I suspect you prefer the education of hill-folk who know how to fix tractors but think we never landed on the moon cuz them govermints are out ta get yer guns! The green party is trying to turn everyone into pot smoking homosexuals who will destroy the world right? But the sad reality is that it's Wal-Mart receipts (all thermal printer ones aamof) which are causing your floppy disk. Personally I'm more apt to believe the museum in this case because they wouldn't be accusing the fishermen of something unless there was some kind of evidence or a past indiscretion resulting in something similar to this. Maybe there were net marks on some of the corpses? The problem is, that this is not happening in one place it is happening all over the world. So nets simply dont explain schools of fish stranded or birds falling out of the sky. The pole shift however is recorded and ongoing for over a decade.